This slab straight from the Horsham quarry. Had a Natural rough face that made this an interesting project. A welcome challenge for our CNC shop. The surface varied by random 1½ inches over the face. So producing V cut lettering without our Laser surface reader would be impossible. 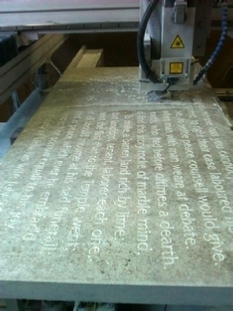 The scan was at 3mm metrix which was ideal for this surface. The scan took 15 minutes. We used a 90 degree V Cutter for the lettering which took about 45 minutes to machine. We did a finish cut with a new cutter which took about 20 minutes as we speeded the transfers speed up for this final cut. Machine: Series 1 PROCARV Controller and Laser Scanner. 06/03/2019. Machine shown is in its 9th year of service. The original plaque was installed in 1630 the stone was Petworth or Horsham marble. It dedicated the influential life of John Crabb who discovered that putting lime on his farm fields increased yield. V carved Friz Quadrata lettering. A beautiful style letter which suits Machine V carving perfectly. A Total of 830 letters.